Looking to rack up valuable United miles as quickly as possible? 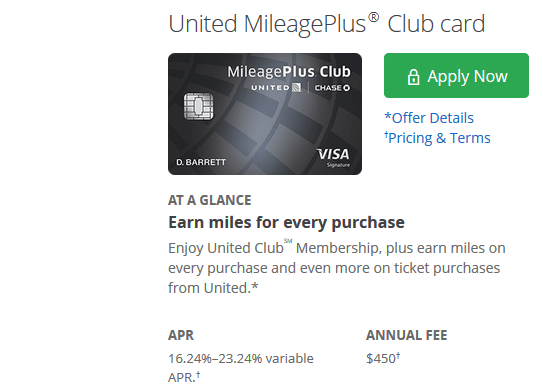 Who Is the United MileagePlus Club Card Good For? As far as airline co-branded credit cards go, the United MileagePlus Club Card is something that people talk about surprisingly infrequently. Is that because it is a poorly constructed product? No, it’s just a premium product that is not a good fit for many United travelers because of its cost. However, that high annual fee ($450) affords a variety of high-end benefits that frequent travelers crave. It’s been voted best credit card in both 2012 and 2013 by readers of Global Traveler Magazine, and when you peruse the long lists of benefits the card comes with, it’s easy to see why. Though its best-known selling point is the United Club access mentioned in the cards name, it also bestows many of the other benefits of Premier Silver status and status with several other travel partners. So if you’re a frequent traveler who could make use of instant elite status, the cards high fee could be worth it. While many co-branded airline cards lure potential customers in with high-mileage sign-up bonuses, the Club card relies on its perks to charm customers who are looking more for quality than quantity. As a result, the best sign-up bonus you’ll find with this card is a $100 statement credit after first purchase or a waived annual fee. What Do Your Points/Miles Get You? Even if you’re just looking to rack up United miles as quickly as possible, this card is a good way to go, as you get 50 percent more miles on everyday purchases than you get with your average co-branded airline credit card, including the United MileagePlus Explorer card. Though United has majorly devalued its award chart, the fact that it doesn’t charge or pass on fuel surcharges makes MileagePlus miles one of the best ways to book many highly desirable airlines and premium cabins that would otherwise require at least $500 in fees. When you use your United miles for domestic flights, you run into the same value as most of their domestic competitors, though your miles go farther on United’s p.s . (premium service) flights, where the BusinessFirst option is priced as business but offers service more like a first class flight. But the same flight only costs 25,000 miles one-way and a few dollars in fees through MileagePlus:That’s a 6.3-cent-per-mile value. Booking this same flight on Lufthansa, you’d spend fewer miles (55,000), but pay $470 in fees. Book any seat on any United-operated flight as an award seat, even when there are no award seats left or blackout dates are in effect, by signing in with your MileagePlus number before searching.